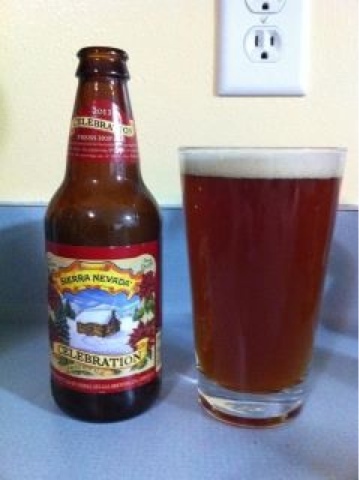 Sierra Nevada Celebration 2011 tonight. They say that, "The long, cold nights of winter are a little brighter with Celebration® Ale. Wonderfully robust and rich, Celebration® Ale is dry-hopped for a lively, intense aroma." Well I think I would have to agree. There is a reason his beer scored in the mid-90s at Beer Advocate and high 90's at RateBeer. It is refreshingly hoppy due to the fresh hopping which give it a far more floral character than many other hoppy beers. It pours a gorgeous copper color with a fine cream color head. This is highly recommended. And if anyone is in the area I have another 18 bottles. Huzzah!